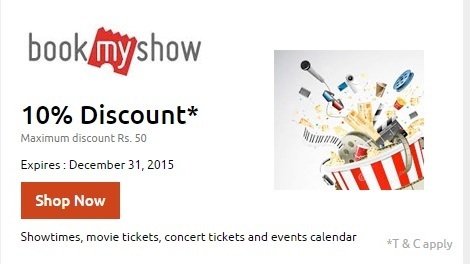 PayUmoney BookMyShow Offer - Now you can get 10% discount in BookMyShow.com when you make payment through PayUmoney. You should be a registered user of PayUmoney. If you are not a registered user already, register now. The registration process is quite simple. 2. Book tickets as you normally book. 3. When you make payment, choose PayUMoney as payment option. 4. Pay through PayUmoney. If you are not an existing user of PayUmoney, you have to register yourself. 5. Get 10% instant discount. Maximum discount amount is Rs.50 per transaction. 1. Payments should made through PayUmoney to avail this offer. 2. Customers will receive a 10% discount and maximum discount is Rs.50 per transaction. 3. Customer must be a registered user of PayUmoney. 4. Discount offered is instant. 5. Offer is valid till 31 December 2015. 6. This offer cannot be clubbed with any other offer/promotion which are being run by PayUmoney. 7. PayUmoney's specific terms and conditions are applicable.